Roger I (c. 1031–1101 Mileto), called Roger Bosso and The Great Count or Jarl Rogeirr, was the Norman Count of Sicily from 1071 to 1101. "He was a youth of the greatest beauty, of lofty stature, of graceful shape, most eloquent in speech and cool in counsel. He was far-seeing in arranging all his actions, pleasant and merry all with men; strong and brave, and furious in battle." In 1057 he shared the conquest of nearly all of Calabria excepting Reggio with his brother Robert. For a time Roger lived like a bandit in his castle of Scalea, near Cosenza. In a treaty of 1062, the brothers divided the conquest so that each was to have half of every castle and town in Calabria. Roger had first thought of conquering Sicily when he and his brother conquered Calabria. At the time, it was ruled by Muslims and the population was mostly Greek Byzantine Christians. The Arab princes had become all but independent of the sultan of Tunis. In May 1061 the brothers crossed from Reggio and captured Messina. After they took Palermo in January 1072, Robert Guiscard, as suzerain, invested Roger as Count of Sicily. Robert retained Palermo, half of Messina, and the north-east portion (the Val Demone). Not till 1085 was Roger able to undertake a systematic conquest. In March 1086 Syracuse surrendered, and when in February 1091 Noto yielded, the conquest of Sicily was complete. Much of Robert's success had been due to Roger's support. Similarly, when the leadership of the Hautevilles passed to Roger, he supported his nephew Duke Roger against Bohemund I of Antioch, Lando IV of Capua, and other rebels. In return for his uncle's aid against Bohemund and the rebels, the duke Roger surrendered his share in the castles of Calabria to his uncle in 1085, and in 1091 his inheritance in Palermo. Roger's rule in Sicily became more absolute than that of Robert Guiscard's in Italy. In addition, due to immigration by Lombards and Normans, Latin Christianity gradually replaced that of the Greek Byzantine tradition. At the enfeoffments of 1072 and 1092, no great undivided fiefs were created. The mixed Norman, French and Italian vassals all owed their benefices to the count. No feudal revolt of importance arose against Roger. In 1091 Roger, in order to avoid an attack from North Africa, set sail with a fleet to conquer Malta. His ship reached the island before the rest. On landing, the few defenders the Normans encountered retreated and the following day Roger marched to the capital Mdina. Terms were discussed with the local qadi. It was agreed that the islands would become tributaries of the count himself and that the qadi should continue to administer the islands. With the treaty many Greek and other Christian prisoners were released, who chanted to Roger the Kyrie eleison. He left the islands with many who wished to join him and so many were on his ship that it nearly sank, according to Geoffrey Malaterra. Maltese legend has it that the Count gave the Maltese their red and white flag by cutting a part of his banner. Mass is said once a year in remembrance of the Count at the Cathedral of Mdina, as a recognition for the Count's role in liberating Maltese Christians from Muslim dominance and rule. Politically supreme, the count also became master of the insular church. The Papacy, favouring a prince who had recovered Sicily from Greeks and Muslims, in 1098 granted Roger and his heirs the Apostolic Legateship of the island. Roger created new Latin bishoprics at Syracuse, Girgenti and elsewhere, nominating the bishops personally, while he turned the archbishopric of Palermo into a Catholic see. He practiced general toleration towards Arabs and Greeks, even sponsoring the construction of over twelve Greek monasteries in the Val Demone region. In the cities, the Muslims, who had generally secured such rights in their terms of surrender, retained their mosques, their kadis, and freedom of trade; in the country, however, they became serfs. Roger drew the mass of his infantry from the Muslims; Saint Anselm, visiting him at the siege of Capua, 1098, found "the brown tents of the Arabs innumerable". Nevertheless, the Latin element began to prevail, as Lombards and other Italians flocked to the island in the wake of the conquest, and the conquest of Sicily proved decisive in the steady decline of Muslim power in the western Mediterranean from this time. Roger's eldest son, Jordan, predeceased him. Roger's second son, Geoffrey, possibly illegitimate, was a leper with no chance of inheriting. Emma (died 1120), briefly engaged to Philip I of France; married firstly William VI of Auvergne and secondly Rudolf of Montescaglioso. Roger's other daughter called Matilda married Guigues III, Count of Albon. ↑ Gordon S. Brown, The Norman Conquest of Southern Italy and Sicily, (McFarland & Company, Inc., 2003), 110. ↑ Medieval Italy: Texts in Translation, ed. Katherine L. Jansen, Joanna Drell and Frances Andrews, transl. G.A. Loud, (University of Pennsylvania Press, 2009), 428. ↑ I. S. Robinson, Henry IV of Germany 1056-1106, (Cambridge University Press, 1999), 292. Norwich, John Julius. The Normans in the South 1016–1130. London: Longmans, 1967. 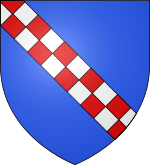 Aubé, Pierre. Roger II de Sicile. Un Normand en Méditerranée. Payot, 2001. Houben, Hubert (translated by Graham A. Loud and Diane Milburn). Roger II of Sicily: Ruler between East and West. Cambridge: Cambridge University Press, 2002. Alex Metcalfe. The Muslims of Medieval Italy. Edinburgh, 2009.